I have made it a goal to increase my Asian cooking skills. Here’s my latest attempt. 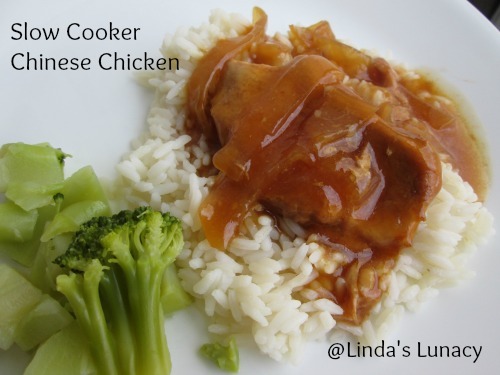 Slow Cooker Chinese Chicken. This is a really easy recipe, made with ingredients you most likely have on hand already. Two important qualifications when I’m cooking! lol I’ve made this a few times now, and my family loves it. I tried this recipe with and without the orange juice and ketchup. The ketchup adds a little something something. And it tastes better with it. You can leave the orange juice out of you like. It’s good without the OJ, but much more flavorful with it. This recipe doesn’t have a strong orange flavor to it, it’s pretty mild. If you would like a stronger orange flavor, you can add some orange zest, or even more oj concentrate. 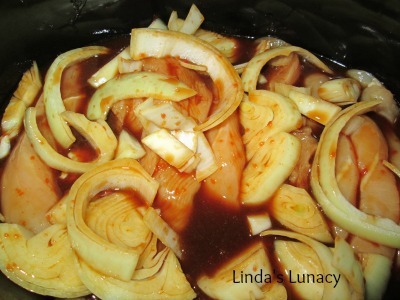 Place the chicken and sliced onions in slow cooker. You can leave the chicken breasts whole, or slice or dice them. Slicing or dicing will allow the flavors to penetrate the chicken better. I like to slice mine thick, as you can see in the picture below. Stir together the soy sauce, brown sugar, OJ concentrate, ketchup, ginger and garlic powder. Pour over chicken and onions. Cook until chicken is done. In my big slow cooker, this takes about 4 hours to cook on high, and about 6 hours to cook on low. My slow cooker cooks fast, though. Adjust the time according to how fast your slow cooker cooks, since cooking times can vary between different slow cookers. Cooking time also depends on how big your chicken pieces are. About 15 minutes before serving, stir together cornstarch and water, until there are no lumps. Add to crockpot and stir well. Cover, and let it thicken until ready to serve. I serve it over rice, with veggies on the side. I used boneless skinless chicken breasts, but this recipe will work with boneless skinless chicken thighs just as well.